When she was seven, Rayya Elias and her family fled the political conflict in their native Syria, settling in Detroit. Bullied in school and caught between the world of her traditional family and her tough American classmates, she rebelled early. Elias moved to New York City to become a musician and kept herself afloat with an uncommon talent for cutting hair. 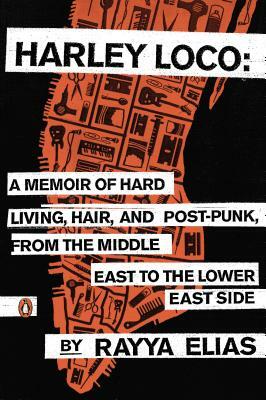 At the height of the punk movement, life on the Lower East Side was full of adventure, creative inspiration, and temptation. Eventually, Elias’s passionate affairs with lovers of both sexes went awry, her (more than) occasional drug use turned to addiction, and she found herself living on the streets—between her visits to jail. This debut memoir charts four decades of a life lived in the moment, a path from harrowing loss and darkness to a place of peace and redemption. Elias’s wit and lack of self-pity in the face of her extreme highs and lows make Harley Loco a powerful read that’s sure to appeal to fans of Patti Smith, Augusten Burroughs, and Eleanor Henderson. Rayya Elias was born in Aleppo, Syria, in 1960 and moved to Detroit in 1967. She is a musician, hairdresser, filmmaker, and also sells real estate to make some extra scratch. She lives in New York City and Little York, New Jersey. "Rayya Elias's life reads like Huck Finn on heroin. Her story of fleeing Syria as a child, growing up in Detroit and spending her young adulthood trolling around the East Village is as American as they come, including as it does immigration, addiction and hard won deliverance. Through it all Elias's voice burns fire hot and is completely engaging."